Riviera Country Club is Jimmy Walker's favorite golf course. Oh, he'll always have fond memories of CordeValle, Waialae and Pebble Beach -- sites of his three victories this season -- much like Willie Mays and Hank Aaron enjoyed hitting at Wrigley Field even though neither was ever a member of the Chicago Cubs, but it's almost as if Walker has stumbled into history as one of the fastest to three wins in a single season while on the way to his ultimate destination in Pacific Palisades, Calif., for this week's Northern Trust Open. Entering the season, The Old White TPC (host of The Greenbrier Classic) was the site of Walker's highest bankroll at any event. Riviera was second. After missing the cut in his debut here in 2005, he's 6-for-6 with a pair of T4s. Suffice it to say that his spot below is warranted. Riviera is a par 35-36--71 that measures 7,349 yards. It averaged +0.850 strokes to par last year, making it the fourth-hardest of nine par 71s in non-majors. Its Achilles' heel is the trio of par 5s. Nos. 1, 11 and 17 averaged just 4.59 in 2013 to rank just inside the top 10 easiest sets on the PGA TOUR. But it's buckle-up-and-hold-on time elsewhere. Last year's field split only 51.82 percent of the fairways. That's its lowest since data collection began in earnest in 1992. Riviera's greens in regulation percentage was just 58.01 -- third-lowest on TOUR in 2013 -- not too surprising given the scant number of divots in the short grass and the 5,000-square foot putting surfaces. Getting up and down is no bargain either, as pars were saved 56.75 percent of the time, making Riviera the 15th-most challenging on which to scramble. Defending champion John Merrick played an efficient if not sparkling game tee-to-cup and led the field in the all-around ranking and par-5 scoring (4.09). Critical to his success was that he played the par 4s in 4.00, good for T11 on the week. Riviera's par 4s, including the famed 10th hole (4.067), averaged 4.15 last year, tied for fifth-highest on the season. Superb weather is expected throughout the tournament. High temperatures in the mid-70s will accompany sunny skies. Winds are forecast to be light. Jimmy WALKER FedExCup points leader ranks third in strokes gained-putting, eighth in adjusted scoring, 22nd in scrambling and fifth in par-4 scoring. 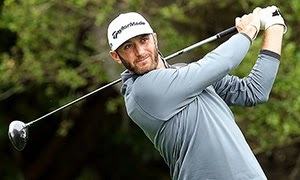 Dustin JOHNSON T2 at Pebble Beach after a four-week break. Five straight top-12s. Three top 10s at Riviera, including a T3 (2010) and a T4 (2012). Hunter MAHAN Focus of converging trends. Career-best T8 in eight visits to Riviera last year. T4 (WMPO) and solo sixth (Pebble Beach) the last two weeks. Webb SIMPSON Six top 10s in his last seven starts; also a T23 at the Humana. Two top 15s in as many starts at Riviera; actual scoring average of 69.00. Bill HAAS Horse for the course. Chased his playoff win here in 2012 with a T3 last year after leading entering the finale. Also placed T12 in 2011. Keegan BRADLEY Missed the cut at WMPO, his first MC since the 2013 U.S. Open. In between, logged 12 top 20s. Tied for second here in 2012; T16 in 2013. Jordan SPIETH Co-leader at AT&T midpoint; finished T4 (at 8-under 67-67-78-67--279) for his seventh top five on PGA TOUR, all within the last 11 months. Ryan MOORE The throwback has survived the last six cuts at Riviera (two top 20s). Six top 25s in his last seven starts, including a T6 at the WMPO. Jim FURYK With rust dusted off with a T35 at the AT&T, he's making his 18th start at Riviera. Six top 25s, including a T11 in 2012 and T13 last year. Matt KUCHAR Something will give. He's 8-for-8 at Riviera but hasn't posted a top 10. Meanwhile, he arrives with top 10s in last six starts worldwide. Graham DELAET Co-runner-up in his last two starts. No worse than T7 in his last four. Currently 7th in total driving, 6th in GIR, 2nd in adjusted scoring. Hideki MATSUYAMA First appearance at Riviera. Rebounded from an injury to his left wrist with a T16 at the Farmers and T4 at the WM Phoenix Open. Pat PEREZ Thirteenth consecutive appearance. Among 10 cuts made, just one top 10 (solo eighth, 2007), but four top-11s over the last five weeks. Justin ROSE Great site to return from mild tendinitis in right shoulder. Top 15s in last two trips to Riviera. Top 10s in last five starts worldwide. Will MACKENZIE Just 1-for-5 here, but hasn't competed since 2011. All six cuts made this season are top 15s; last four are career-bests in those events.